This delicious Cherry Fruit Salad recipe was originally called “pink salad” but I changed it to cherry fruit salad to better reflect what kind of salad this is. Yes, it is pink, but it’s more than just pink! It has a delicious and creamy, cream cheese and cool whip base with fruit cocktail, pineapple, maraschino cherries, walnuts and marshmallows thrown in. It is really spectacular and sweet enough to be a dessert. Almost everyone who tries this recipe wants a copy. It’s really easy and quick to assemble, too. I recommend leaving it in the refrigerator overnight if that’s a possibility. That way the flavors can mingle with the creamy base. I love looking through my cookbook and reminiscing about the people who gave me each individual recipe. This recipe was given to my by one of my favorite friends in the early 1980s. Bonnie Rodriguez was a gal who mentored me in cooking, hospitality, and the Christian faith. She loved to try new recipes and I can’t remember any of them failing. She was the one who spurred me on to trying more recipes out of cookbooks and magazines — recipes that I had never tasted before — rather than just relying on recipes I had sampled. Bonnie brought this salad to a potluck in the very early 1980s and it was an instantaneous hit with our family! 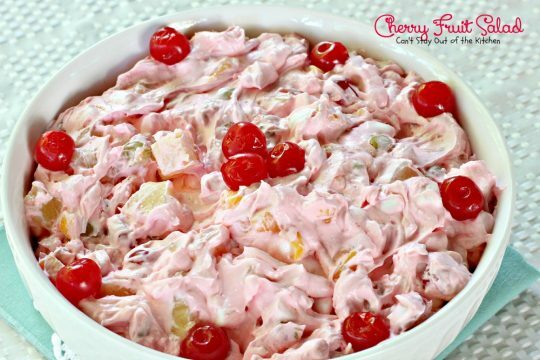 Cherry Fruit Salad has been one of John’s favorite recipes through the decades, too. Many times he would prefer a bowl of this delicious salad over dessert. Anytime we took home leftovers he would have them gone in no time! Part of the reason for that is he loves pineapple, and this recipe has pineapple in it! I used fresh pineapple this time because I was trying to use it up, and the maraschino cherries that we had on hand were pitted and sliced so that saved a good bit of time on prep work. 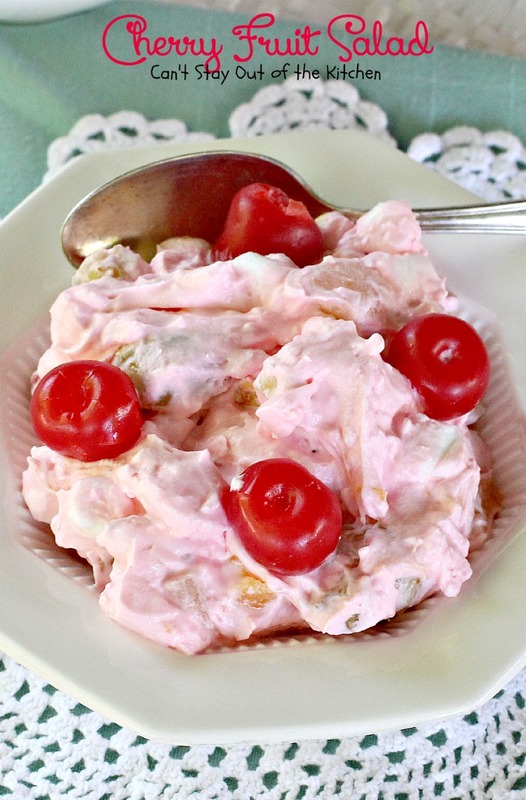 This is a great salad to take to potlucks, barbecues, block parties, or even family reunions. Because it uses mostly canned ingredients it can be made in the winter time as well, when fresh fruits are not so readily available. I think you’ll love this recipe. We sure do. When I first posted this recipe in September 2012, I had only been blogging about three months. My first 200 or so posts were taken with an iPhone 3 camera which, while they provided a picture, the pictures were still of a blurry, grainy quality and many times on the dark side as well. This recipe has always been so popular on my blog I decided to remake it and take pictures again (April 2015) when we had a potluck for our Sunday school class last week. This lovely salad also makes a great side dish for holidays like Thanksgiving and Christmas, and since you make it night before, it can really be a time saver in preparation time. Cherry Fruit Salad is a fabulous, fluffy salad recipe. One of our all-time favorites! 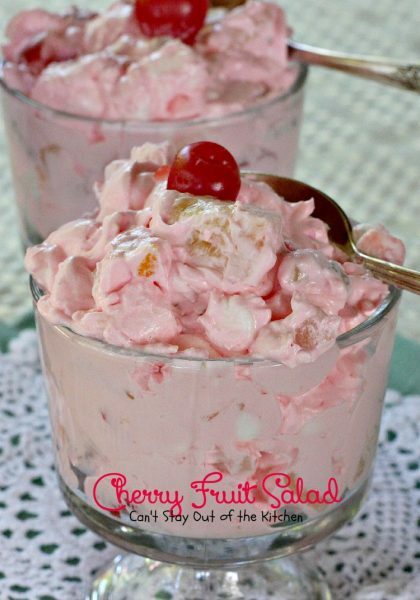 Here’s a quick peek at this yummy “pink” salad. 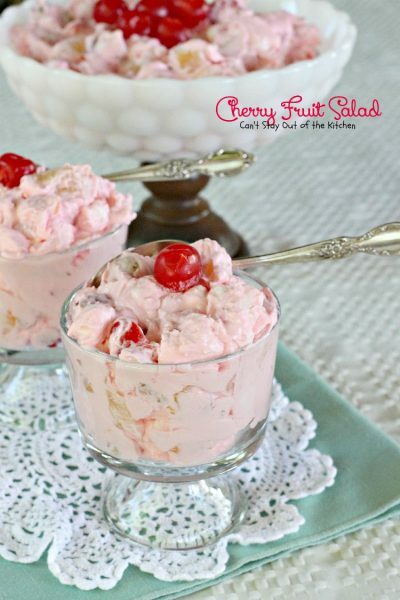 Cherry Fruit Salad is a great side dish for holidays like Thanksgiving, Christmas or Easter. 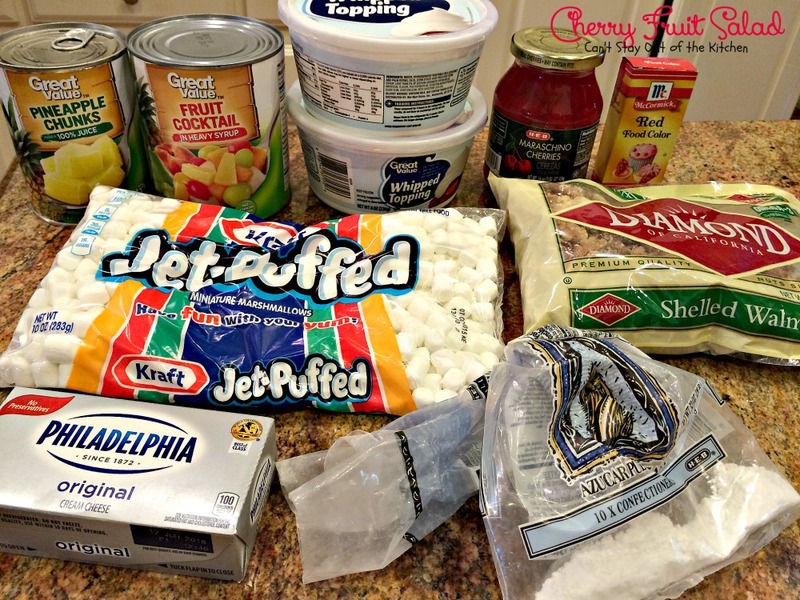 Soften cream cheese. Put in a bowl with powdered sugar, non-dairy whipped topping, red food coloring and 5 tablespoons fruit cocktail juice. Mix all the ingredients with an electric mixer. Yes, it’s going to be a “pink” salad. Add drained pineapple, drained fruit cocktail, marshmallows and nuts. Rinse and drain maraschino cherries. 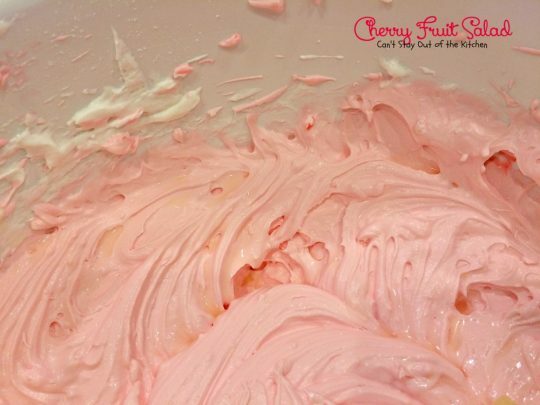 Pat dry and add to bowl with pink cream cheese mixture. Stir ingredients with a wooden spoon to combine. Garnish with more cherries, if desired. 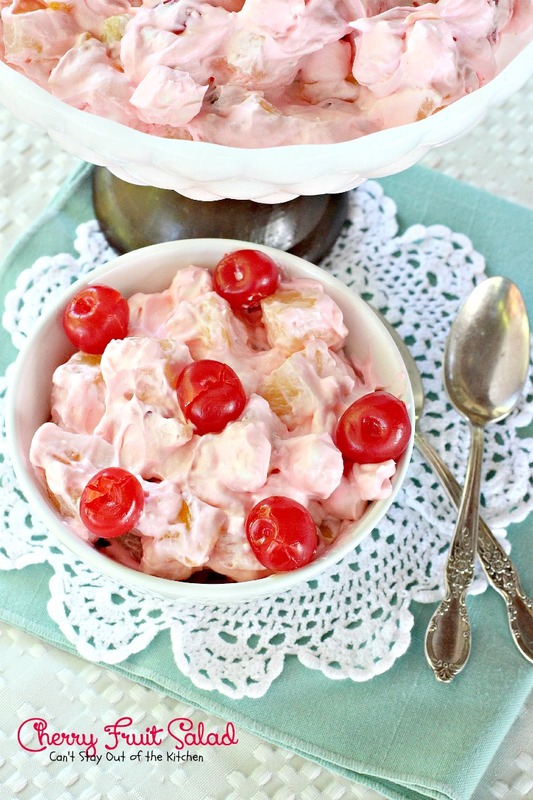 Cherry Fruit Salad is sweet enough to serve as a dessert! Here’s a serving for you! Fabulous fruit salad with a cream cheese base that includes maraschino cherries, marshmallows, walnuts, pineapple and fruit cocktail. Mix cream cheese, whipped topping, powdered sugar, 5 tbsp. reserved fruit cocktail juice, and a few drops of red food coloring. Add fruits, fruit cocktail, marshmallows and nuts. Stir. NOTE: I like to blot the cherries, pineapple and fruit cocktail dry with paper towels before adding so the salad stays nice and thick and doesn't get watered down from the syrup the fruits come in. 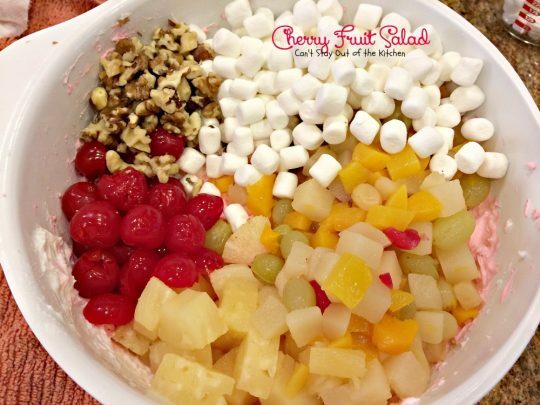 Author: Teresa Ambra adapted from Bonnie Rodriguez when we attended First Baptist Church Indian Rocks, Largo, FL (This salad was always referred to as Pink Salad). 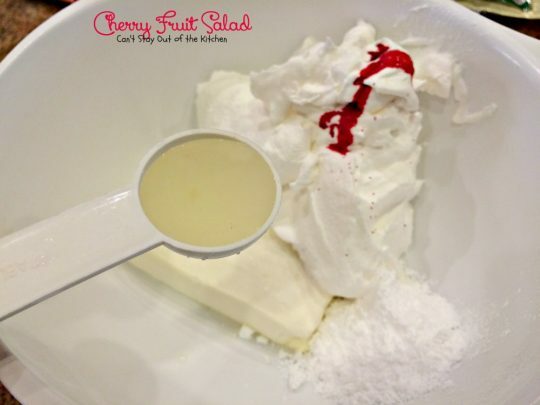 I like to blot the cherries, pineapple and fruit cocktail dry with paper towels before adding so the salad stays nice and thick and doesn’t get watered down from the syrup the fruits come in. This fruity salad is great to take to potlucks because you can make it the day beforehand. Doesn’t Cherry Fruit Salad look luscious? Does this salad have a strong cream cheese taste to it? I don’t think so, Brittney. There’s so much Cool Whip in it that it dilutes any excessive cream cheese taste to me. I tried strawberry jello mix for coloring…. I bet it was good!Thanks for sharing. We make a similar salad but we just add a little bit of the cherry juice to turn the salad pink.. a perfectly natural food coloring. That sounds like a great way to do this, too. Hi Ginger. This is just one of those recipes I’ve always followed the way it was written. Thanks for stopping by. Have a great weekend. This brings back memories. I had a salad like this when I was little. 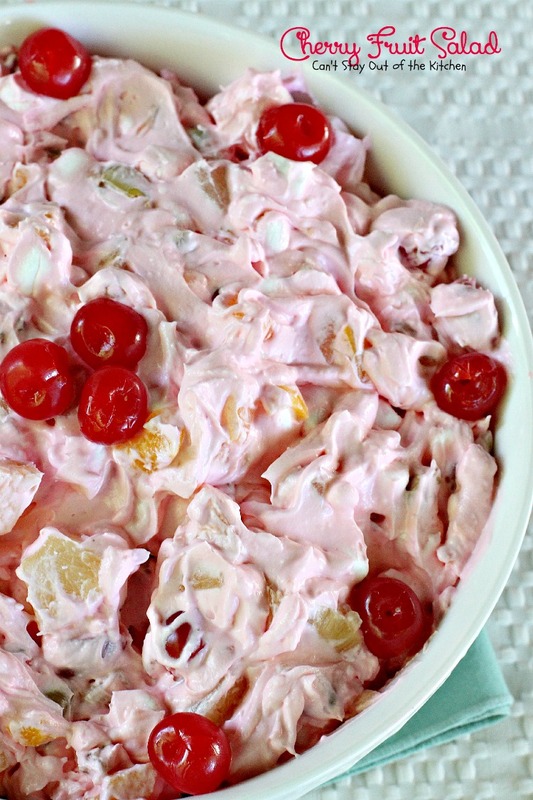 It was called Ambrosia Salad, but it had chocolate chips in it too. Wow, that sounds interesting. Chocolate chips? I may have to give it a try sometime!This is one of my husband’s favorite salads. He loves the fluffy ones and would rather eat that then dessert! 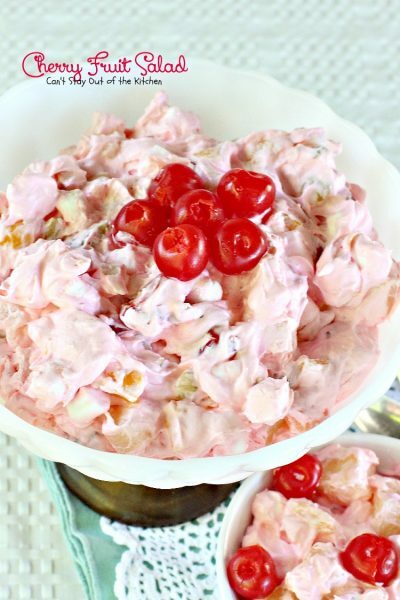 Oh my, how this salad brings back memories…..but again something I have never made myself, but have enjoyed at many a family gathering. Thanks for the recipe, I can see this on the Thanksgiving table this year. Yeah, it is wonderful. I served it today and everyone loved it! For every family gathering there always a similar dish. It is green! We affectionately call it green stuff. 🙂 I think it is make the same except pistachio jello is used. Yes, I have a couple of recipes for that, too!